They often compete with other birds such as Phainopepla for desert fruit such as mistletoe berries. The Western Bluebird is a common winter resident of the Sonoran Desert and Sabino Canyon: also as a permanent resident in the forested regions. A medium-sized bird of 7 inches with a wingspan of 13.5 inches, the Western Bluebird travels in small groups of up to 10, feeding on insects or fruit found on the ground or in vegetation. Bluebirds hover to catch insects or to pick berries and use a technique known as ground-sallying: flying from a perch and settling briefly on the ground to capture an insect before returning to a perch. They often compete with other birds such as Phainopepla for desert fruit such as mistletoe berries. The slightly larger Phainopepla can be seen defending its “territory” from groups of Bluebirds. In the winter Western Bluebirds often roost communally, with many individuals sharing the same cavity for the night. Female coloration is similar to the male’s, though quite a bit drabber. 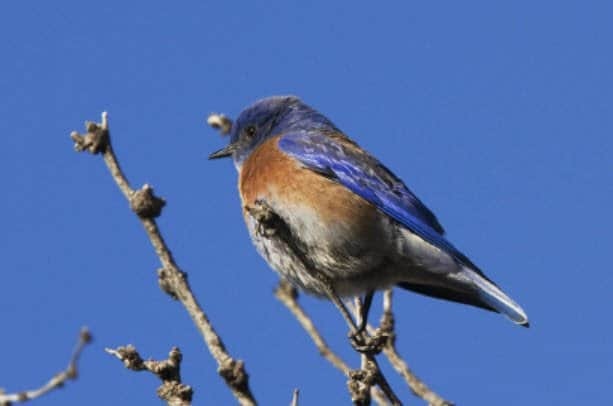 The Western Bluebird differs from the Eastern Bluebird in its throat coloring, It has chestnut under parts that distinguish it from the Mountain Bluebird.